Starring Guillaume Canet, Catherine Deneuve, Adèle Haenel, Judith Chemla, Mauro Conte, Jean Corso, Hugo Sablic, Jean-Pierre Getti, Pascal Mercier, Tamara De Leener, Jean-Marie Tiercelin, Peter Bonke, Laetitia Rosier, Noël Simsolo and Yani Redjala. Distributed by Cohen Media Group. 117 minutes. Not Rated. Despite getting lead billing in this film (her seventh collaboration with writer/director André Téchiné) and the role of the real life woman who wrote the book that In the Name of My Daughter (L’homme qu’on aimait trop) was based upon, legendary French actress Catherine Deneuve actually has a supporting role. And yet her regal presence suffuses this film – a film where co-stars Guillaume Canet and Adèle Haenel also turn in excellent performances – so that even when the grande dame is not on the screen, you are thinking of her. In the Name of My Daughter is based upon a real life cold-case mystery. The apparent crime took place in the 1970s and the case has been in French courts as recently as 2014, with the current ruling on appeal. Yet, oddly, and somewhat refreshingly, the actual crime is not the main focus of the film, in fact the mystery and court cases 40 years later are pretty quickly dispatched in the last half hour. 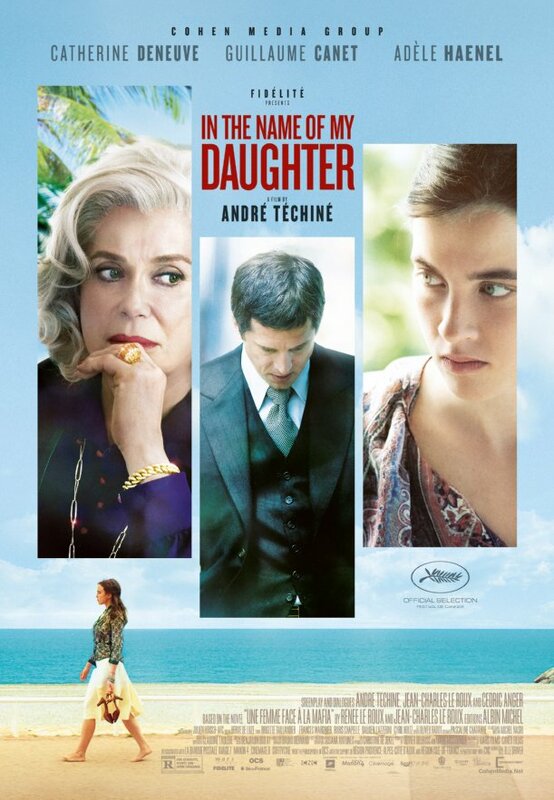 In the Name of My Daughter is more of a character study, a look at the relationships between a rich but estranged mother and daughter and the slightly shady lawyer who insinuates himself into their lives. The film is based on a 1989 book by real-life former French Riviera casino mogul Renée Le Roux (Deneuve plays Renée) and takes place mostly in 1976. Renée is trying to take control of the casino that her late husband had left. As the action starts, her daughter Agnès (Adèle Haenel) is returning home from Africa, smarting from a recent divorce. Relations between Agnès and Renée have been strained for years, but they do feel a deep love for each other. Agnès has lots of plans to be independent – getting her own apartment instead of living on her mother’s compound, opening her own store – however in order to get her life moving forward, she needs inheritance money (approximately three million dollars worth of francs) which is being held in trust by her mother. Renée is in the middle of fighting off a hostile takeover bid by a local mafioso (Jean Corso) and needs all the cash she can have, so she is dragging her feet about giving her daughter the money. In the middle of this powder keg is dropped Maurice Agnelet (Guillaume Canet), a married lawyer who has been working for Renée and has visions of an important executive role in her casino. Renée likes but doesn’t totally trust Maurice, who appears to be a corporate yes man, but can be ruthless at times. Agnès and Maurice do not get along well at first, however they eventually become friends, then when he has a falling out with Renée he becomes Agnès’ legal advisor and eventually her lover. As Agnès falls more deeply under his spell, she betrays her mother, becomes majorly depressive, starts stalking him, survives a suicide attempt and eventually vanishes. In an interesting stylistic choice, Téchiné and Canet have decided to play Maurice as very sketchy from the very beginning. He always feels suspicious, and the more that you get to know him – his womanizing, his questionable business ethics, his selfishness, his commitment-phobia, his using, his casual cruelty – it only cements the distrust you always had towards him. The final act, in which the film flashes forward thirty-some years in search of some legal closure actually drags a bit, ending the film on a down note. The limited revelations it offers do not add much, though the passage of time allows Deneuve to hit yet another fascinating note in her character. Copyright ©2015 PopEntertainment.com. All rights reserved. Posted: May 22, 2015. Tags: Adèle Haenel, Agnès Le Roux, André Téchiné, catherine deneuve, Cohen Media Group, disappearance, Guillaume Canet, Hugo Sablic, In the name of my daughter, jay s jacobs, Jean Corso, Jean-Marie Tiercelin, Jean-Pierre Getti, Judith Chemla, L'homme qu'on aimait trop, Laetitia Rosier, Maurice Agnelet, Mauro Conte, movie review, murder, Noël Simsolo, Pascal Mercier, Peter Bonke, PopEntertainment.com, Renée Le Roux, Tamara De Leener, true story, Yani Redjala. Bookmark the permalink.